Well, that depends on how valuable you consider the time, money, and resources being used on developing a product. A lot of companies don’t realize that the risk at the start of a software development project is really high. The best way to understand if the idea of that product (project) has growth potential, solves someone's problems, or has any business value at all, is NOT coding it straight away. That means wasting a lot of money and hours, and energy down the drain, potentially! We are not dismissing the importance of coding here. What we insist is that there are better ways to approach the product developing process. You don’t have to blindly risk everything before even getting to a viable product. There are two main risks in pursuing the development of the idea blindly: the risk of uncertainty (a lot of unknowns) and the risk of misunderstanding (because of the various parties involved). By putting prototyping in the middle of the two (idea and final product) we aim to reduce these risks involved in the process, and our work has shown us that we actually do. We are not saying that this will lead you directly to success either: the philosophy here is that if there’s failure ahead, let’s fail faster, cheaper, and smarter so that the improvement can be faster too. 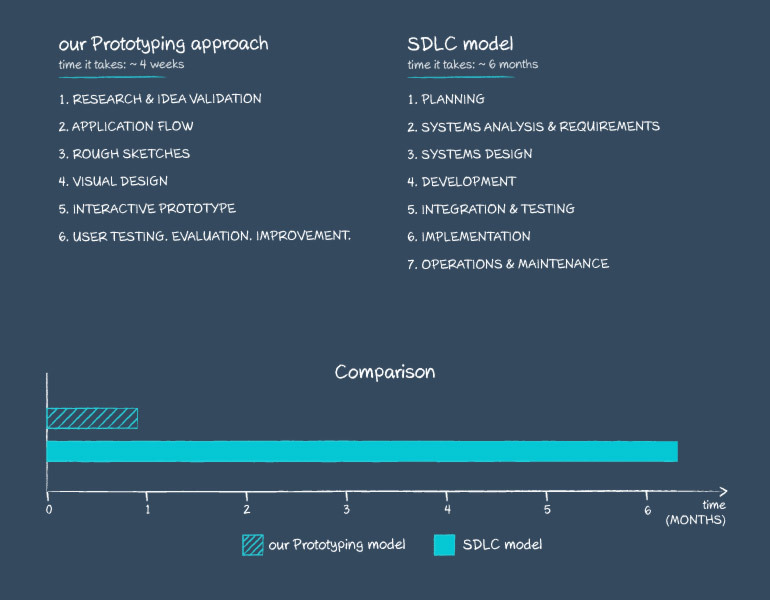 With the advancement of the prototyping software, the importance of the software prototyping as a service has grown enormously (although companies haven’t realized that, yet). Combine this with the other prior steps of the process as a whole, and you get a killer mixture. A lot of errors in the application flow, user experience, and even in the idea itself can be found through this process. “The goal of a prototype is not to be right, but to get an answer.” - Diego Rodriguez. Exactly! 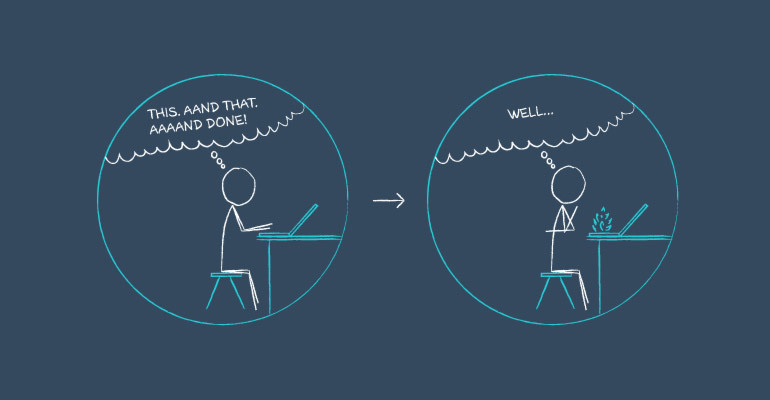 There are some assumptions before starting to build the prototype, and what you try to do is prove or disprove those assumptions, based on real feedback, from real users. 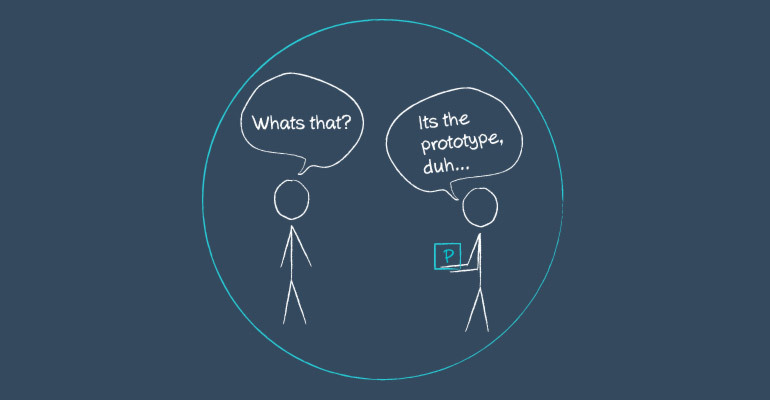 You don’t expect the prototype to act like a real application (as it is NOT). You don’t focus on its features being perfect or working without errors. Its purpose is simple: show others that you’re serious about your endeavour. The process starts with the idea being validated via market research, users and their needs. After days of analyzing the data, classifying them, and brainstorming, the team, in close collaboration with the client, defines the objectives of the application and start to build the application flow. This gets reviewed by the devs and awaits their green light. Once they have a ‘go’, the work continues with the initial sketches of the application. These are rough designs of the application, just to tell the others what is going to be placed where. The results are sent to the stakeholder for review and feedback. Once that’s received, the visual design continues, and the application gets its polished interface. After that, the actual prototype starts to build: pages get linked to each other, inputs store the data inserted, long story short, the application gets interactive. With this tangible thing in hand, the client has something to show to users (and investors) and we have another source of extremely valuable data: real user feedback. This makes the prototype increase in value, as all future changes are based on the actual people destined to use that.